Shawls, ponchos, and capelets are versatile and look fabulous on everyone, no matter the occasion. 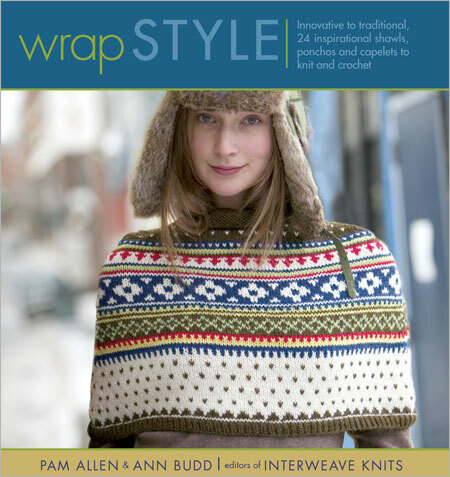 Wrap Style is a collection of 24 classic and contemporary wraps from 18 knitwear designers, including Lily Chin, Teva Durham, Nicky Epstein, Norah Gaughan, Deborah Newton, and Jo Sharp. The designs for these ponchos, capes, stoles, and capelets vary from simple to challenging and explore shape and silhouette possibilities in a host of techniques including stitch patterns, color work, lace, beads, crochet, and felt. Also included is an in-depth chapter on designing and a clearly illustrated glossary that provides all the information necessary for even a novice knitter to successfully create one-of-a-kind fashions.